It is clear to me that we have all of the technological solutions we need to change our trajectory of destruction on this Earth. However, after eons of trauma and perpetuated patterns, we have lost our connection to ourselves and the earth—the curse of greed and challenging human dynamics are blocking us from a collective shift. It’s time to unpack and lay out your natural wisdom and gifts on the table in service. It is your duty to courageously step into leadership in this new paradigm. You are the solution. Reconnection with the rhythms of our bodies, the earth, and the moon. 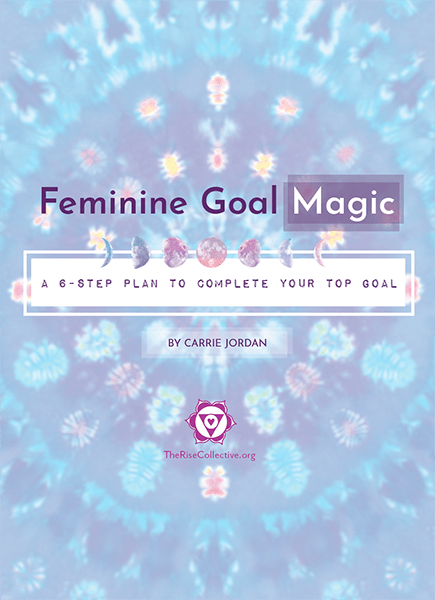 With this workbook, learn the best timing, structure, and practices for gentle feminine goal setting magic. Finish the things you start, focus your energy, and experience powerful shifts in all areas of your life with a combination of accountability, folk magic, and structure. Learn how to heal your ancestry and mindset, incorporate the feminine flow of nature and your body, and create habits and goals you commit to. I’m right here to support you as you learn and discover the rhythm and wisdom of your womb, the moon and the earth. Sister, I know that this can often be a vulnerable place for women: it’s unknown, uncertain, and sometimes scary to welcome Grace into our lives. I feel a lot of compassion for where you’re coming from, and I’m looking forward to supporting you.